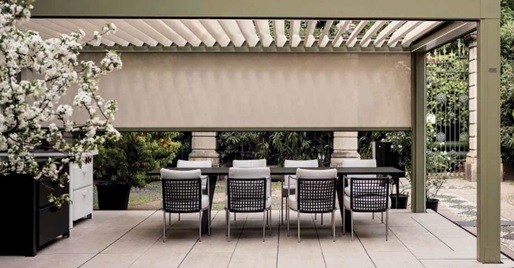 The OPERA model louvered roof Pergola® and NOMO retractable fabric roof Pergola® systems can be fitted with roll down RASO screens for extra weather or sun protection on all sides. This optional zipper screen system can be ordered with vinyl fabric and clear "film" windows or mesh fabric. The Vinyl fabric and windows are great at keeping moderate weather at bay during the winter months or rain during spring and summer months. 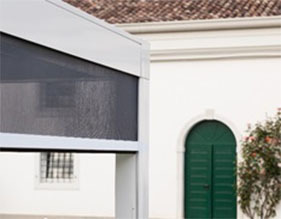 If you only need sun protection on the sides or desire to keep mosquitos and pesky bugs at bay, alternatively our mesh screen fabrics can be utilized on the roll down shades as well. These optional roll down “Raso” screens can be added to the OPERA and NOMO models only. 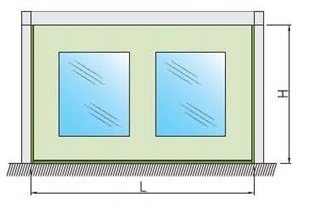 These screens are uniquely integrated within the gutter system and not visible when the screen is fully retracted in the up position. The tracks are also integrated within the posts for a modern clean look. 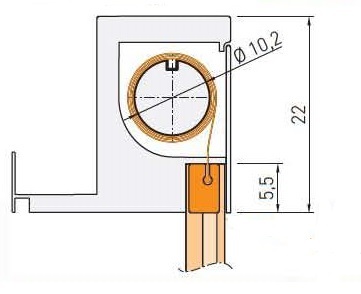 Some other systems will only offer optional add on screens with external cassettes and tracks added to the bottom of the gutter system and side posts. These external screen cassettes are fully visible under the gutter system when the screens are in retracted position. Raso zipper screens with mesh fabric. Raso zipper screens with windows. The RASO rolling zipper shades can be used for sun and insect control or used with clear vinyl windows for light weather protection. Simply roll down the screen with the touch of the remote button and built in motor and the zipper system will do the rest. The fabric runs inside vertical zippered guide tracks by means of gravity. 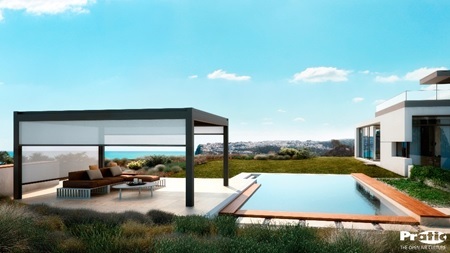 When the shade is retracted the fabric is stored in the gutter or header at the top out of view. A specially designed horizontal weighted hem bar keeps the fabric taut when the fabric is lowered. 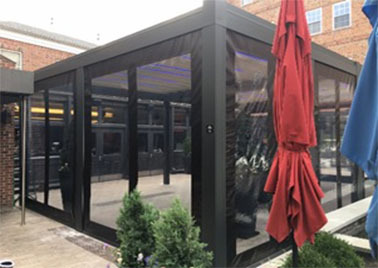 These optional shades are ideal for use in conjunction with the OPERA & NOMO Pratic Pergola® systems to create a side screen enclosure. 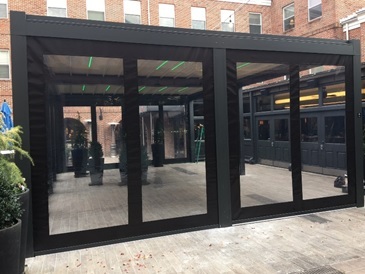 The recommended mesh fabric is Soltis 86, and if vinyl fabric with windows are desired, use the same Soltis Ferrari 602 or 502 vinyl used on our Pergola® fabric awnings. The RASO rolling zipper shades have a special zipper and PVC insert in the tracks. The zipper is attached to the side of the fabric, and slid into a PVC extrusions inserted inside the track the entire height of the screen. As the shade is lowered and raised, the zipper then rides up and down in the PVC insert, which retains the fabric within the track. See illustration below. Raso screen within the Gutter system. Zipper track and hem bar. Screen remote control for motor.